During his State of the State address in January of 2017, Governor Herbert issued a challenge to Utah businesses to create 25,000 jobs throughout the 25 rural counties outside the Wasatch Front in the next four years. The rollout tour for this initiative visited Iron County on Thursday, August 3rd and was hosted by Southern Utah University’s Small Business Development Center. The event was part of the 30th anniversary of the annual Utah Rural Summit. “The 25k Jobs Initiative is helping to focus resources - helping to increase awareness of tools available to help our local businesses succeed,” said Craig Isom, director of the SUU Small Business Resource Center. The initiative comes at a time of great economic prosperity for Utah, but the concern is that the prosperity does not extend to all counties, some of which do not have the resources necessary to foster economic growth in their community. In his address to rural community leaders from across the state, Governor Herbert made several candid comments about the obstacles facing rural Utah. These obstacles included a changing market as a result of improved technology, a need for improved infrastructure, and the fact that no silver bullet exists to solve the problems rural Utah is facing. Beyond the actions already taken, Governor Herbert has invited local leaders to come to the capitol and discuss what obstacles are inhibiting growth in their specific communities, what their plan is to overcome those obstacles, and what exactly they need from the government to make that happen. The initiative has taken a “bottom up” approach rather than establishing mandates or cutbacks on communities that struggle to support small businesses. Instead, the initiative seeks to support local businesses in their pursuit of expansion and provides incentives for companies to establish themselves in a rural community. This approach is intended to both elevate employment rates in rural communities and provide the personnel needed to fill positions in larger companies who have struggled to find employees. “We as the government are not here to tell you what to do in your counties… we don’t create jobs, the private sector does,” said Lt. Governor Spencer Cox. Cox, who commutes 100 miles to the capitol every day so he can continue to reside in Sanpete County on the family farm, has taken a leading role in the initiative due to his firsthand experience with the rural community. 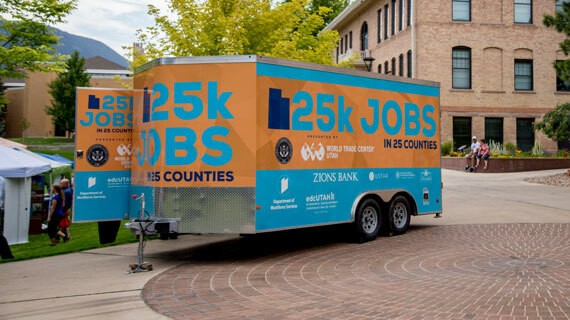 The 25K Jobs Tour provided an opportunity for citizens to learn about what resources exist to help them with their businesses and express needs to community leaders. The SUU Business Resource Center is a year-round resource to aspiring entrepreneurs and community leaders. “The SUU Business Resource Center and Small Business Development Center are focused on helping businesses ‘grow and go.’ We welcome the Governor's initiative as a way to help bring to light the resources available to all businesses in our community,” said Isom.